We are going to use Datatable to display the employee list. We have to import the module in the employee module in order to use the component. So in employee.module.ts include this add DataTableModule in imports. 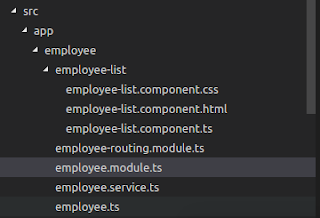 And in employee-list/employee-list.component.ts we will create an array of employee object . So we will call the service in an function and we will call the function in ngOnInit. ngx-bootstrap is another library which uses bootstrap for styling. We are going to use the modal popup of ngx. Why? Simple its' component style makes it separate item and its responsive. Let's install ngx-bootstrap. We will add the ModalModule in employee.module.ts. Next we need create the popup for the employee view. Lets create a component. We will add bootstrap modal template with bs-modal directive. We will have a openPop variable inside employee-view.component.ts which will use to determine whether to show the modal. @Input and @Output is used to communicate with the component. EventEmitter is used to emit events from the component so that the parent component can listen. Why openPopChange eventemitter? Because we need to update the openPop when the use dismiss the modal by other means. The onHidden function listens to the onHidden eventEmitter for the bs-modal and it will emit the openPopChange emitter which will set the openPop false. We will add the component in employee-list and once the user clicks on the little information button in the data list, it will set the openPop value as true and the modal will pop up.